Yvonne and her young son Tristan. A MOTHER FROM Cork says she’s been met with opposition by a local preschool when trying to enrol her son in classes because medicinal cannabis is required to treat his condition. 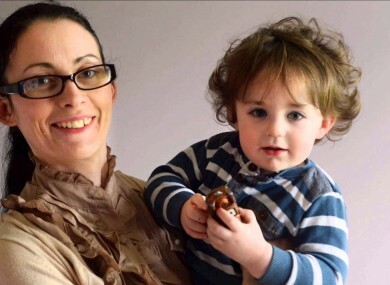 Yvonne Cahalane used to travel regularly to the United States for cannabis oil treatment for her son Tristan, who suffers from Dravet Syndrome. Three-year-old Tristan is the first Irish person legally allowed use cannabis oils for medical use as they reduce his seizures considerably. Speaking to Patricia Messinger on C103’s Cork Today Show, Yvonne said she got a registered letter Monday afternoon saying there was no longer a place available to Tristan due to facilities at the school. Yvonne says that local preschool Naíonra Bheanntraí had been reluctant to educate her son before this, requesting that either of the two parents needed to stay outside the school door everyday in case something happens. It’s been something every single day. He’s two months seizure-free now, the only time anything happens is if he’s sick, and if we thought he was sick we wouldn’t even bring him in. Even still, the preschool requested more forms – including medical records. Yvonne asked them to write down a list of issues the school had, and right at the top was the title ‘cannabis oil’. “Straight away, the teachers said they were afraid to deal with him and were excluding him from class, not changing him at school even though we’d signed forms allowing them to change him. It’s really all about stigma with epilepsy and his condition and now the stigma with his medicine. When asked if she thought if the preschool didn’t trust the cannabis oil was for medicinal use, Yvonne said that one teacher stated clearly if Tristan was to have a seizure “she would not give him the cannabis as it was a controlled drug”. She says that there are other children in the Naíonra who require specific medicinal care or treatment. Yvonne now is looking for school places for both her sons. Email “'I won't let him be excluded by his condition': Toddler refused place at preschool”. Feedback on “'I won't let him be excluded by his condition': Toddler refused place at preschool”.